- When the floor is tarnished you may need Chinese tea then soaked in the towel and wipe up the floor is clean wood. 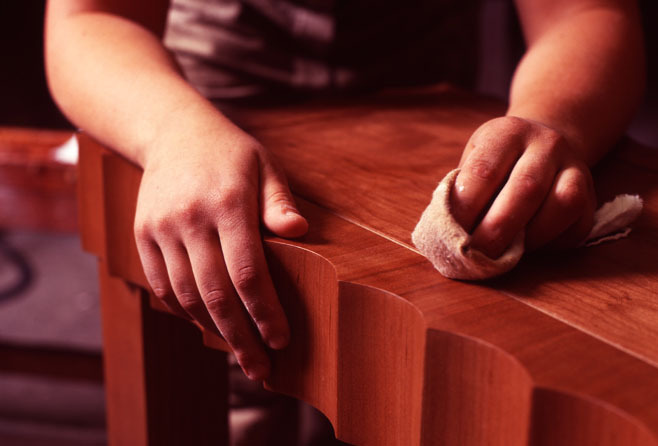 - If you want to lighten the varnish on the furniture, you may need a little milk and wipe on varnish and let it dry. Then use a scrub brush with water. With this method, the varnish will be hard and shiny. - You may also need beer and soft cloth, and then use the towel to wipe the wood and eventually wipe them dry with a towel. Your furniture will shine and you will be surprised. - Remove the stain was a long time: You let a few drops of oil into a little white wax, testament to the melted wax. Then, this wax is applied to the stain and rubs hard with a towel. - When you want to clean the stains caused by flies on furniture, use a little flour mixed with oil, making it consistency, apply the stain and clean with cloth. Finally, wash with water and polish. - When you want to clean the stain stick on the supplies of wood that has not been varnished, first, try mixing one type of water to clean by the formula: 10 grams of salt + 90 grams of bleach (soude de caustique) + 1 liter of water. After that, you take broom is made of coconut sheath and seep into this type of water and sweep up the wood products that has not been varnished. For a long time, you wash with water and wipe dry with a soft and clean cloth. - If you want to make your small wooden things shiny as new, you can get cotton osmotic pine oil (essence de terebenthine) clean up nicely. Then let it dry and polish it. - If you want to disappear the white blisters on the table with varnished wood, use a cloth soaked in paraffine oil and lightly rubs blisters. Then, using a pine oil type up and polishing by cloth. - If you want to cover cracks, holes in the floor, you get glue mixed with fine sawdust, mix it well, boil for hot, plastered on the openings, flattened surface. If the wood floor have varnish, you must use varnish to spread paint on the place was closed for the same color. It's really a great share. Go ahead. And If you are looking for the best and fantastic furniture and if you want to buy online from home then you should try this site. Nothing more, just go and review the product and if you like then you can place a order within a minute. Thanks for sharing these tips. Keeping wood furniture at its best needs our attention. Good post. We can take some beneficial tips from here regarding how to take care of wooden floor; otherwise we are facing problems with our wooden flooring such as; damage and cracks. Therefore polishing and other possible steps should be taken to prevent these problems; it is really tough to maintain wooden flooring system and experts are always suggest to take very good care of wooden floors. Here also we can get some suitable tips on how to maintain floors. Thanks for such wonderful tips. that the fence will be conveyed with the correct size posts, so you won't need to stress over cutting them up. Hey, thanks for giving me an idea. This is very helpful for me. I'll try this on my home in house and lot for sale in cavite. Thank you very much for sharing!